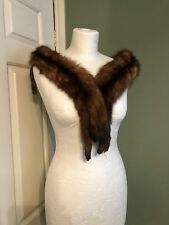 THIS DELIGHTFUL ART DECO MINK COLLAR - THREE MINKS - IS IDEAL TO STITCH ON TO A JACKET OR COAT. IT IS BACKED IN A HOT CHOCOLATE SATIN-LIKE MATERIAL AND EACH MINK HAS ALSO BEEN LINED IN SIMILAR MATERIAL. Rare Beautiful Red Full Fox Fur Stole - for classic night out or GOT role play! Small repair on original clip. A beautiful stole in great condition. Cannes festival 1977, original great condition unboxed scarf, rare. The fur I think may be sable as the pile is too long to be mink, which are usually much shorter. The stole is in very good condition and is an antique as it is 100 years or over going by the style. However, I am not an expert on fur and would be very happy to be corrected. Used in the past for a christening shawl - table cloth - shawl. Beautiful hand-knitted circular item. Has a couple of very small marks otherwise in lovely condition. No Makers mark, in good antique condition. You are looking at a wrap made in the 1940s. Fabric: Soft open weave wool with silver lurex thread highlight. Also can be worn as a voluminous scarf. We make sure we know our products and understand the ever changing market by keeping up to date with the latest products and services available worldwide. Asteria Global Limited was founded in 2013 and has offices based in the UK. It is in very good condition. Recycling is good for everyone! All communication must go through e-bay. Original/Reproduction Original. My nan gave me this gorgeous scarf, it's so gorgeous and can be easily styled in the hair, around the neck or onto a bag. Designer inspired and Art Deco style. Slight wear on One edge See Photo. COLOUR ~ Purple with art deco stripes. DATE~ Original 1970s. ITEM~ Scarf. FABRIC~ Floaty polyester. Material: 100% silk. Used, in excellent condition. Fine Japanese 100% silk scarf. Material 100% Silk. Country/Region of Manufacture Japan. Color Brown.